Seemanchal Express mishap: In a major train mishap, at least seven people died while as many as 24 people were injured after 11 couches of the Delhi-bound Seemanchal Express derailed in Vaishali district of Bihar. The accident reportedly took place in Sahadai Buzurg at 3:58am on Sunday morning. East Central Railway spokesperson Rajesh Kumar was quoted by PTI saying that one general coach, one AC coach B3, three sleeper coaches — S8, S9, S10 — and four more coaches have reportedly derailed, resulting in the death of at least six people on the spot. The train (12487 Jogbani-Anand Vihar Terminal Seemanchal Express) was reportedly running at full speed when the accident occurred. Though the team of doctors and the National Disaster Relief Force (NDRF) were rushed to the spot, locals alleged that officials did not reach the spot in time. The Railways has also rushed in an accident relief train to help the victims. Follow BusinessToday.In’s live blog for all the latest updates on the Bihar train mishap. 12.43PM: Vijay Sinha, SDRF Commandant, says six bodies have been identified out of total 7 casualties in the mishap. 10.49AM: Prime Minister Narendra Modi says he is “deeply anguished by the loss of lives” due to the train derailment incident. 10.44AM: The Bihar government has announced ex-gracia of Rs 4 lakh each to the kin of every deceased and Rs 50,000 to the injured. 9.48AM: The Railways has launched a npreliminary probe; initial reports suggest the train derailment was caused due to rail fracture of CMS crossing at Baruni, claim officials. 9.34AM: The Railways have announced ex-gratia of Rs 5 lakh each to the kin of every deceased; Rs 1 lakh for those with grievous injuries; and Rs 50,000 to those with simple injuries. 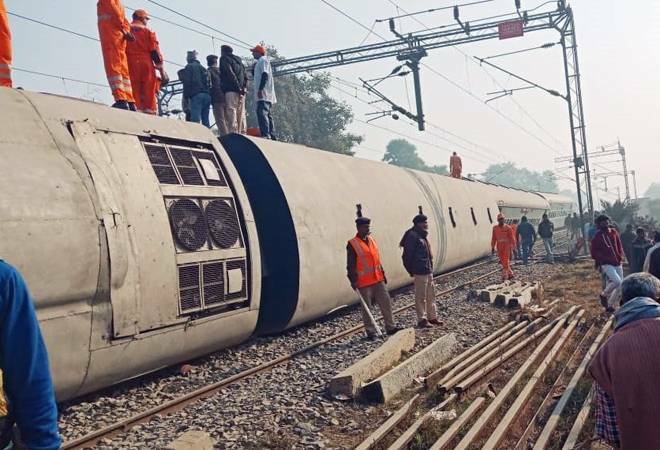 9.30AM: “As of now, it is not clear whether the derailment of the 12487 Jogbani-Anand Vihar Seemanchal Express was caused by a human error or a technical fault. This would be investigated once the rescue operations were complete and the affected Barauni-Bachhwara-Hajipur single line was cleared,” Rajesh Kumar, Chief Public Relations Officer, East Central Zone, told PTI. 9.23AM: The East Central Railway (ECR) General Manager LC Trivedi confirms 7 people lost their lives. 9.08AM: Union Railway Minister Piyush Goyal’s office tweeted he is in touch with Railway Board members and General Manager of East Central Railways regarding the Seemanchal Express accident. 8.57AM: All passenger trains on this route have been cancelled following the Seemanchal Express derailment. All passenger trains on this route have been cancelled following #SeemanchalExpress derailment in Bihar’s Sahadai Buzurg, earlier this morning. Also, Uttar Pradesh trains for Chapra have been diverted via Muzaffarpur (MFP)-Chapra. 8.51AM: The rescue operation by the NDRF teams is underway; locals living in the nearby areas are also extending all possible help. #Seemanchal Express derailment: Indian Railways has issued helpline numbers at Patna-06122202290, 06122202291, 06122202292, 06122213234. 8.49AM: Bihar Chief Minister Nitish Kumar has directed the administration to provide all kind of assistance. 8.46AM: At least 6 people are reported to dead but officials suspect more deaths. #SpotVisuals: 9 coaches of #SeemanchalExpress derailed in Bihar’s Sahadai Buzurg, earlier this morning. 6 people have lost their lives in the incident. 8.44AM: “We are focusing on rescue and relief operations right now,” says Smita Vats Sharma, Additional Director General PR (Rail). Smita Vats Sharma, Additional Director General PR (Rail) on #SeemanchalExpress: We are focusing on rescue and relief operations right now. Railway Accident Medical Van along with team of doctors are at site. Two teams of NDRF have also reached the spot. 8.39AM: Railways officials are saying the train incident might have happened due to ‘decoupling’ of the train, but more clarity on the cause of the mishap is yet to be revealed. 8.15AM: Indian Railways has issued helpline numbers for Seemanchal Express derailment. Indian Railways has issued helpline numbers for Seemanchal Express derailment: Helpline numbers at Sonpur – 06158221645; Hajipur -06224272230 and Barauni – 0627923222.